In reality, the Abhaneri step well, also known as Chand Baori, was constucted by a 9th century ruler King Chand of Nikumbh. It has a dazzling 3,500 symmetrical steps descending from this sides into the 100 foot deep well. During the Mughal era, a pleasure pavilion was later added to one side of the well. Centuries ago, the stepwells were built in the arid zones of Rajasthan to provide water all year through. Today, the construction is not used as a well anymore but its exquisite geometry attracts local and international visitors alike. 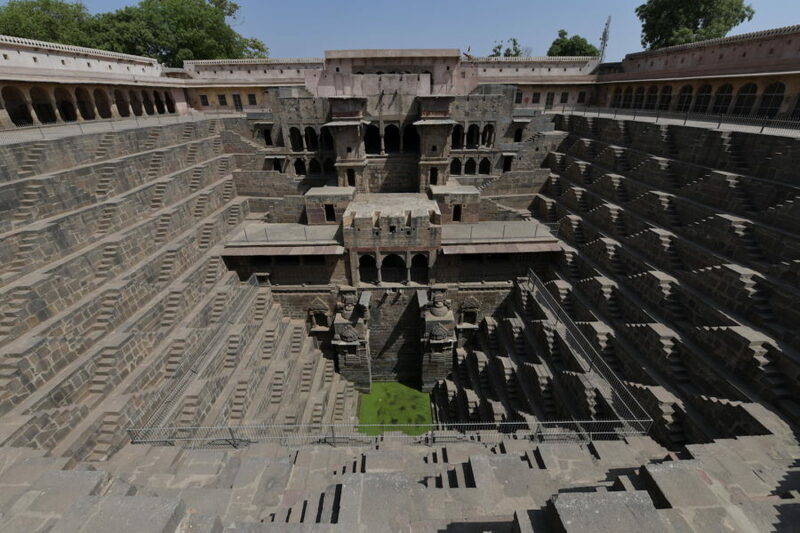 About 64 feet deep, it is India’s largest and deepest stepwells with 13 floors and was built in the 9th century for water harvesting. There is a quaint, ancient Harshat Mata temple, with exquisitely carved statues in the vicinity.